The heavy white volumes Phaidon publishes in their Art and Ideas series are, physically, among my favorite books. The pages are stiff, thick, and unusually white, as if they were enamelled. The font (Bitstream Amerigo) is solid and plump, and the standard type is a sort of half boldface, while quotations are in regular type. Pagination and chapter titles are along the right and left edges of the page, not on top. The images are numbered and clearly labeled; captions always include date, dimensions, and location. Margins and line spacing are generous. A very appealing design. I clipped off the right edge when I scanned the page, but you get the idea. 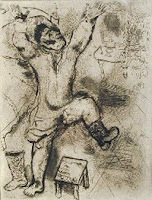 The photo is of Marc Chagall with the legendary Yiddish actor Shlomo Mikhoels, who is also in the painting, doing the splits while playing his fiddle for the appreciative green cow. He was such a great threat to the Soviet state that Stalin, in 1948, personally ordered his murder. I've wandered from my point. Looking at the catalog page, I see that I have now read 12 of the 32 volumes published so far. I'll rank them, most interesting to least. Jacques-Louis David is actually one of my least favorite painters, but this account of his work and life, tangled up with the French Revolution, is close to thrilling. His paintings, technical facility aside, are all context, so this is the way to see them. Rembrandt's life, by contrast, is almost event-free; the book is rather a gentle investigation of a supremely creative mind. The problems with the last two are essentially conceptual. Islamic Art is strained by its need for coverage, while Hogarth treats Hogarth's work more as sociological and historical evidence than as art. In both cases, the approach is understandable, but these books aren't as much fun as some of the others. You would be justified in not believing how much fun Neoclassicism or Early Christian and Byzanine Art is, I understand, but I insist, they're great stuff. Note the attractive use of white space around the 8th century ewer. There may well be better-written or better-argued books on every one of these subjects, but I've never found such an impressive combination of images and text. And then there are the pages, and the font, and so on. They don't make such good public transit books - a bit too heavy. This was plenty gushy. Phaidon should send me some free books. Just post them to the address at the bottom of the site. Hmm, it doesn't seem to be there. Off to the right somewhere? No? I seem to have misplaced my address. Well, if it were the case that Wuthering Expectations had an address, Phaidon should send books to it. I had a wonderful, really excellent, absolutely top notch week on the Yiddish writer S. Ansky planned. But a comment from Neil of the dangerous* Adventures in the Print Trade derailed me, so I'll have to postpone that. Perhaps I will finish S. Ansky week before I devote my life to the study of mummified cats and their importation to England. At some point, I plan to become the world's first full-time mummified cat blogger. But that's in the future. Wandering around in the secondary work on Yiddish literature, the name of Marc Chagall kept coming up, for obvious enough reasons. At some point, it occurred to me that I didn't really know much about Chagall. Didn't like him much, either, for what that's worth. At a later point, it occurred to me that I could read a book about him. That's my solution to everything. Ignorant and slothful, I turned where I always do, to the Phaidon "Arts and Ideas" series, Chagall by Monica Bohm-Duchen. There are certainly plenty of other Chagall biographies. Physically, the Phaidon books are marvels, some of my favorites, so I always go there first, and usually last. The Bohm-Duchen book is fine; I certainly learned a lot. I had no idea that Chagall had such a strong literary connection. The image up and to the left, is Literature itself, somehow, an allegorical image for a theater (there is also Music and Dance). I've adopted this as my Amateur Reader icon, even though it becomes so small that no one can tell what it is. Beisdes befriending every other French poet and writing poetry himself, Chagall made illustrations for Dead Souls, the Hebrew Bible, the Fables of La Fontaine, the memoir of I. L. Peretz - and I'm forgetting some. The only ones that I've looked at with any real attention are the Bible prints, because they're easily available, in a Dover reprint of the French magazine that originally published them. In 1956 and again in 1960, you could just go to the newstand, I guess, and buy a magazine containing nothing but original Chagall prints. And, financially, you should have. On the right, we see Job in despair. Don't worry, Job, God will give you new cattle. As for your sons, ahem, well, you'll get sons, too, just as good as the other ones. 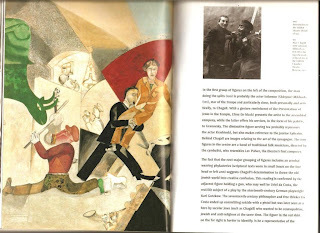 In theory, I should be the most interested in Chagall's illustrations for Dead Souls, since I admire that novel so much. But I'm missing something. I mean, see left. That's certainly Chagall - is it Gogol? These images all strike me the same way. However interesting they may be, I find it hard to see how they serve the text. Maybe the personality of the artist is too strong for the task. Or maybe if I read an illustrated version of the novel, all would be clear. Now, over on the right, Chichikov packing his trunk - that's certainly in the right spirit. Chichikov really is that round, and the view of our non-hero is appropriate. Chagall knew the book well, at least. All right, it's late, so I should stop. And the mummified cats are calling, calling, calling. I'm as bad as Menakhem-Mendl, her husband - I got carried away by work and have neglected Sheyne-Sheyndl. "To my dear, learned, & illustrious husband Menakhem-Mendl, may your light shine! First, we're all well, thank God. I hope to hear no worse from you." "Second, you write like a madman. Second, I'm writing you, my sweetheart, to wish a cruel death to all my enemies. Second, just look at what you've done, you fool! Second, my dear husband, I pronounce you a certified lunatic. You might as well run naked through the streets! Second, my mother says you can't make a fur hat from a pig's tail. I'm referring to your charming sister-in-law Yentl." "If it acts like a donkey and brays like a donkey, it must be a donkey. One man eats garlic and another smells of it. What's a rabbi doing raising pigs?" In one letter, the mother seems to short circuit, just spilling out one saying after another. "She said a few other things too, my mother did. In fact, she left Kreindl speechless." The last two chapters of The Letters of Menakhem-Mendl and Sheyne-Sheyndl are each single letters by Menakhem-Mendl. They're fine, funny stories on their own, but the lack of the exchange of letters with Sheyne-Sheyndl is a great loss. So many of these comic Yiddish stories have a tragic undercurrent, and here's one of them. "May I never read another letter of yours again!" she says in her last letter. Maybe we just aren't getting Sheyne-Sheyndl's side, but maybe she's given up on her restless, useless husband. And of course, Sheyne-Sheyndl's letters may contain a few hints about why Menakhem-Mendl doesn't want to go home, which is also sad. I think Sheyne-Sheyndl sounds like great fun, but I don't have to live with her. I spent some time with a bit of Mark Twain yesterday. Sholem Aleichem is sometimes called the Jewish Mark Twain. Cuz they're both funny. Now see, this transition has moved me from a book about scientists to Mark Twain to Sholem Aleichem. For a transition to be good, though, it should go somewhere or have meaning, unlike this one. A little writing tip for you. Free of charge. I want to say something about The Letters of Menakhem-Mendl and Sheyne-Sheyndl (1892-1901, more or less), a book that, it turns out, has what we call "relevance". Menakhem-Mendl wants to strike it rich, and will try anything legal. His wife Sheyne-Sheyndl just wants him to come home. She's right, of course. Along the way, over six separate stories and a mere one hundred pages, Menakhem-Mendl tries his hand at trading in English pounds, railroad stocks, sugar, timber, oil wells, real estate, and probably more; he also takes a shot at matchmaking, selling insurance, and journalism. I'm not sure that a writer today would have such a different list of schemes - replace the railroads with tech stocks, and put the matchmaking business online. "To my wise, esteemed, & virtuous wife, Sheyne-Sheyndl, may you have a long life! Firstly, rest assured that I am, praise God, in the best of health. God grant that we hear from each other only good and pleasing news, amen. Secondly, I'm through with investing. You can have it! It's no occupation for a Jew. It's made me old and gray before my time. I could write a book on all I've been through. Yehupetz is in ruins. The market has gone bust. There isn't a ray of hope. The carnage, I'm sorry to say, is worse than it was in Odessa. Everyone is in the soup. Everyone is bankrupt, and so am I. Filing for bankruptcy is the latest fashion." "A more painless way to make a kopeck has yet to be devised. Just yesterday I earned 50 rubles - so help the two of us if I know what it was for. I also sold 300 tons of sugar as easily as smoking a cigar. That is, the sugar wasn't mine, but I got into the act, which was good for 50 more." Secondly, Yehupetz real estate is for the birds. I'm now in country property." "Always a Loser," the last chapter is titled, and how else could the stories work? Menakhem-Mendl is not greedy, really, although he is utterly selfish. He's restless and vain, and wants to be a player, a big man, more than a rich man, much more. That's why he always finds himself on the wrong side of the bubble, and why he never stops trying one thing or another. He's a great character, even if he has about a third of the depth of Tevye the Dairyman. I have neglected the other character in the book's title. Sheyne-Sheyndl deserves her own post. Now there's a character. The zippy translation is Hillel Halkin's, in the New Yiddish Library edition. 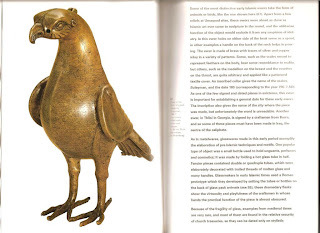 All right, now I have a real complaint about Remarkable Creatures: its author abuses literature. I didn't actually discover this; mia moglie gets all of the credit. "What is it that confers the noblest delight? What is that which swells a man's breast with pride above that which any other experience can bring to him? Discovery! To know that you are walking where none others have walked; that you are beholding what human eye has not seen before; that you are breathing a virgin atmosphere. To give birth to an idea--to discover a great thought--an intellectual nugget, right under the dust of a field that many a brain-plow had gone over before... These are the men who have really lived--who have actually comprehended what pleasure is--who have crowded long lifetimes of ecstasy into a single moment." "What is there in Rome for me to see that others have not seen before me? What is there for me to touch that others have not touched? What is there for me to feel, to learn, to hear, to know, that shall thrill me before it pass to others? What can I discover?--Nothing. Nothing whatsoever. One charm of travel dies here." All right, that sounds like Mark Twain. The high-pitched rhetoric is never more than a setup for the deflation. In this case, at least, Twain doesn't literally contradict the idea of the first passage - he just says that it's unavailable to most people, which may merely contradict a major theme of Carroll's book. In fairness, two points. First, I actually don't care that Carroll's epigraph crushes the irony of the passage. In fact, I'm positively happy. Epigraphs destroy the old context and create a new one; that's how they work. "I shall not speak of the railway, for it is like any other railway--I shall only say that the fuel they use for the locomotive is composed of mummies three thousand years old, purchased by the ton or by the graveyard for that purpose, and that sometimes one hears the profane engineer call out pettishly, 'D--n these plebeians, they don't burn worth a cent--pass out a King;'--[Stated to me for a fact. I only tell it as I got it. I am willing to believe it. I can believe any thing.]" In a sense, I'm not quite the right reader for Remarkable Creatures. Not because I already have the history of science covered - ho ho, no - but because I am interested enough to read more. A lot of what Sean Carroll is doing - a lot - is summarizing other books that are worth reading. He does it adeptly (although the seams show, sometimes), so for many people his book will be porridge of the desired temperature and consistency. I'm willing to push a little farther, both in terms of difficulty and length. To stick with Darwin, for example. Carroll's thirty page chapter on Darwin (less, really, including the illustrations and map) gives half of its length to the Beagle voyage, five years of Darwin's life. For Carroll's main theme, the urge to go out and discover something, this makes sense, and I have no argument with his account of the trip. Or only one argument, which is that The Voyage of the Beagle is very much worth reading on its own, entirely accessible, well written, and even funny. It's also five hundred pages, not thirty. Darwin's Beagle is the only primary text of Carroll's that I have read, so one real benefit to me of his book is the bibliography. I already knew that I wanted to read Henry Walter Bates's account of his eleven years in the Amazon, mostly during the 1850s. But I had not expected Arthur Wallace's The Malay Archipelago (1890) to sound so good. Let's look that one up - how long is it? 544 pages, I see. How about T. rex and the Crater of Doom (1997) by Walter Alvarez, about the discovery of the Yucatan asteroid impact and the extinction of the dinosaurs? 216 pages; all right, definitely reading that one. Carroll covers this ground in an action-packed eighteen pages. OK, how about Neil Shubin, Your Inner Fish - 256 pages, almost a real book (seventeen pages in Carroll, and a must read for fans of Arctic exploration stories). In general, the old books - the ones that belong here on Wuthering Expectations - are long and longer, while more up-to-the-minute science books are rather more petite. Well, who knows when I'll read any of them, but I've made a list. Two books on the list are by Sean Carroll, so I guess that's some praise. Carroll is not actually a science historian, but rather a leader in a field called evolutionary developmental biology. Endless Forms Most Beautiful (2005) and The Making of the Fittest (2006) will apparently tell me what that means. This will almost be a proper book review. Sean Carroll's Remarkable Creatures: Epic Adventures in the Search for the Origin of Species is a pop science book about naturalists and their expeditions. Each chapter, beginning with Alexander von Humboldt's Amazonian journey of 1799-1804, describes a scientific adventure that led to a major discovery. The earliest expeditions - Humboldt, Darwin on the Beagle, Arthur Wallace on the Malay Archipelago, Henry Bates in the Amazon, Eugène Dubois digging up the "Java Man" - really are like traditional adventures, long, slightly crazy voyages to barely known lands by naturalists who have no idea what they will find, while later chapters are inevitably stitched together from the work of a multitude of researchers, although one or two scientists always keep center stage. Still, each narrative really is an adventure story, even if a lot more of the work moves into the laboratory. The Roy Chapman Andrews-led 1922 Monogolian Expedition is pretty exciting, with nomadic bandits, tents full of vipers, and the discovery of the first dinosaur egg fossils. But the steps that led Luis and Walter Alvarez to the proof that an asteroid strike ended the Mesozoic era and wiped out (most of) the dinosaurs is at least as thrilling, although it would be harder to turn into a movie. Carroll's style is conversational and pleasant. The quality of his writing is comparable to that of a good National Geographic article. Each piece is logically structured - I was never confused - and the book as a whole successfully presents an overarching argument. Remarkable Creatures fits in well between two other recent books. The Great Naturalists (2007) begins with early modern naturalists and ends just after Darwin, just as biology professionalizes. Carroll can't compete with the amazing illustrations in The Great Naturalists, but he's a better storyteller than most of the many contributors to that book, and of course the loss of those stunning paintings is part of the story of how the science changed. And he demonstrates that the era of great expeditions has changed, but not ended. Carroll's last chapter, on the history of the study of Neanderthals, is like a shorter version of Nicholas Wade's equally exciting Before the Dawn, which blends various strands of up-to-date research on human prehistory into a coherent story about the global spread of Homo sapiens. Many conventional book reviews include some piece of pro forma negative criticism, to show that the reviewer is a serious person, I guess. Let's see. Carroll is inconsistent with the use of first and last names. In the chapter on the Leakey family, for example, it's easy to see why first names are necessary (Louis, Mary, Richard). But why is Darwin "Charles" while Charles Walcott (discoverer of the Burgess Shale fossil deposits, among many other achievements) is "Walcott"? Hmm, why? I have a more serious - well, not a criticism, exactly - idiosyncratic comment, let's say, that I will save for tomorrow. Carroll's book is almost propagandistic, for Darwin and natural selection, I suppose, but also - but mostly - for scientific fieldwork, for getting out of the lab and into the world. I understand that Carroll has put together a not-quite-the-same version of the book, Into the Jungle, where the propaganda is directed at high school and university biology students. I found the propaganda to be extremely effective. Really, what could be more satisfying than identifying a previously unknown species, or finding a new fossil. Carroll's book gives stay-at-homes like me an easy way to share some of that excitement. A little too easy! No, that's for tomorrow. A poem for the last day of winter - Do you know what time it is? It is late in the Winter night. And forget to go to bed. "Upon gaining the vault, forth flew a score or two of bats, extinguishing the flambeau, and leaving us in darkness, like Belzoni deserted by his Arabs in the heart of a pyramid. The torch at last relumed, we entered a tomb-like excavation, at every step raising clouds of dust; and at last stood before long rows of musty, mummyish parcels, so dingy-red, and so rolled upon sticks, that they looked like stiff sausages of Bologna; but smelt like some fine old Stilton or Cheshire." Much of what is wrong with Mardi is on display here ("relumed"), but I don't care. I want to look at those mummyish, sausagey, aromatic scrolls. Hmm, maybe I don't want to look at them. Maybe just those last two. A pious Jew died, leaving many wonderful books, which the heirs sold to strangers. And when the other pious Jews saw this, they were pained that the children should be selling off their father's books. Now in the same town there was a great sage, and he said to the pious people: "Don't feel so bad that the books are coming into strange hands. Let me tell you why this is happening and how he sinned. That man never wanted to lend a book to anyone. For he said he was an old man and his books might confuse him and he couldn't see very well. 'Others might ruin my books. So I won't lend my books to anyone.' But a man should not act like that. And since he never lent his books to anyone, they are now coming into strange hands." from The Mayse Book (1602), by Jacob ben Abraham of Mezritch, translated by Joachim Neugroschel, No Star Too Beautiful: An Anthology of Yiddish Stories from 1382 to the Present. Herman Melville shows how to eat a cuttlefish with gusto. "Now, to the fact of his not being rated a demi-god, was perhaps ascribable the circumstance, that Borabolla comported himself with less dignity, than was the wont of their Mardian majesties. And truth to say, to have seen him regaling himself with one of his favorite cuttle-fish, its long snaky arms and feelers instinctively twining round his head as he ate; few intelligent observers would have opined that the individual before them was the sovereign lord of Mondoldo." My only point, such as it is, is that I don't think this is the correct way to eat a cuttlefish. Is it? And it's being eaten alive, right - "instinctively twining"? So maybe that's the first problem. Anybody else picking up just a hint of H. P. Lovecraft here? Last week was chaotic for me; this week will probably be the same. So all week on Wuthering Expectations: pointless chaos. Actually, I don't know if I have the energy for chaos. So strike "chaos," but keep "pointless." The quotation can be found in Chapter XCV. That's right, chapter 95, of 195 total. Sholem Aleichem left Russia in 1905, after witnessing a pogrom from the second story of a hotel. From then on, until his death in 1916, he was a wanderer, to New York and back to Europe, writing and performing his monologues. He and his family ended up in New York City; Sholem Aleichem is buried in Queens. His relationship with the new world was complicated. New York (and Argentina, and Canada) were refuges for persecuted Jews, and presented great economic opportunities. But in Sholem Aleichem's New York stories, the materialism seems to overpower Jewish culture. He had always satirized greed, but his New York monologues are angrier. "You saying how America was a lend of business? Never mine! Det's how it's suppose to be. But a fella getting merry wid a goil for business? Det, you'll poddon me, is mean end doity. Now, I ain't preaching no morality here, but I am telling you it's a fect; when nine-end-ninety procent of grinnhorns in dis country is getting merry for business, it is making me med! End if I am meeting op wid such a kind of grinnhorn, belive me he don't get off dry. You live it to me!" Then Mr. Tummler tells us, in a few pages, and one burst of words, how he sells a young couple a laundry business, drives them out to re-purchase it at a discount, and then sells it to them again, in the process consuming their savings and destroying their marriage. Perfectly horrible. Why would he tell this to Sholem Aleichem, or whoever the listener is? Because, like he says above, he is entirely justified. 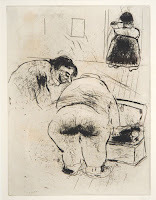 "Because it ain't enough he got his hends on soch a poifect peach to make whoopee wid plus make hay wid her tousend dollar in kesh, but he wants she should woik so he can sit rond wid his pels all day playing pinochle, end son on - because, mister, I know my pipple!" It's a sort of revenge on the baser instincts of humanity by the basest of them all. In this story, New York is dangerous and brutal, and it is other Jews that are the danger. The dialect of these passages is an attempt by the translator to render the Yinglish of the original. There's another reason for Sholem Aleichem's anger. America may save Yiddish in some ways (later, terribly, more than anyone could have guessed), but it might also destroy the language. I'm quoting from Classic Yiddish Stories of S. Y. Abramovitsh, Sholem Aleichem, and I. L. Peretz (2004), ed. Ken Frieden, tr. Ted Gorelick. Nineteen to the Dozen: Monologues and Bits and Bobs of Other Things has the same story as well as a funnier, somewhat less brutal New York monologue, "Mister Grinn Gotta Job. As Told by Himself and Here Set Down in His Own Words ." So greed is bad, I think we all more or less agree about that. What's a fellow to do about it? Be less greedy, I suppose. Or reform society from the ground up. Every Yiddish writer I have considered here - to my knowledge, actually, every one I have read - was a socialist of some sort, and many were some variety of Communist. The degree of radicalism varied a lot, but in the face of brutal poverty, an oppressive Russian state, a materialistic America, and so on, all of the writers ended up on one side. Or, to be more precise, all of the literary writers. * There seems to have been a lot more disagreement about Zionism than about the redistribution of property. H. Leivick's play Shop (1926) is first-rate agitprop by one of the Communist writers. Jewish garment workers in a Lower East Side factory go on strike, and win. The good people more or less get their way, the bad people do not. At the end of Act II, the workers sing the "Internationale." What keeps the propaganda interesting is exemplified in the songs in Act I: two flighty young things come to work singing "Yes, sir, that's my baby \ No, sir, don't mean maybe," while an older woman sings a traditional Yiddish sewing song. The play's politics are idealized, but the characters and setting have some reality of their own, and are allowed to argue back a little. "The pattern of the dance is transformed into something which welds the people with the machines. Severe and inhuman from the start, it changes increasingly into a storm. Hands outstretched and faces like fire. At its greatest heat, as the dance reaches ecstasy, screams and whistles are suddenly heard from the street." "The shop is alone. The machines make noise; they make noise." * This is vaguely related, apparently, to why I haven't come across any early female Yiddish writers. The few women who were fortunate enough to be educated and had the temperament to write did not want to waste their time with literature. Rosa Luxemburg and her kindred spirits were going to change the world. Yiddish playwrights are against greed. Me, too, no evil eye. All of the plays in God, Man, and Devil: Yiddish Plays in Translation are American (written in the U.S., performed in New York theaters), but most of them are set in the old country, not so old for most of the audience. The best play, I think, it the one Nahma Sandrow puts in the title: Jacob Gordin's God, Man, and Devil (1900). Gordin was a giant in the Yiddish theater, it's first serious playwright. He was right in the mainstream of modern theater, and reminded me at times of Ibsen or Ostrovsky. Gordin was a Tolstoyan who wanted to use the theater to educate the masses about high culture; as a result, he wrote a stage version of The Kreutzer Sonata, and The Jewish King Lear, which I must, must read. God, Man, and Devil has a literary predecessor, too, as one might guess from the title. This is a Faust story. In a simplified version of Goethe's prologue, Satan, not to be mentioned on anyone's blog, convinces a distant, preoccupied God to let him test the virtue of a pious man with riches. Satan, no evil eye, actually tells us that this has be more like the story of Faust than Job, because "Nowadays a Jew is used to sorrows." The dapper Mephistopheles, not to be thought of, calling himself Uriel Mischief, inveigles the poor, virtuous scribe Hereshele into buying a lottery ticket, a winner. Hershele is a genuinely religoius man, but the money, and Mischief's influence, ruin his and his family's lives, no evil eye, in more or less predictable ways. We get divorce, industrial accidents, attempted murder, all sorts of dramatic things. The ingenious thing about the play is how Hershele's worst traits turn out to have been present all along, and how they are brought out through his interactions with his wife and father and other characters. The story of a man destroyed by his greed, good stay, evil away, is not exactly subtle, but the dramatic revelation of his character is expertly done. Hershele really is a good man, but not just that, like all of us. It was asking for trouble to mention the devil, not to be mentioned, or good luck, no evil eye, and Hershele has a superstitious neighbor who has all of the formulas necessary to ward off all the bad effects. I have interlarded my text with some of them. She, of course, mentions luck and the devil more than anyone. A good gag for a play where the devil is an onstage character. David Pinski's play The Treasure (1906) is also a greed play. An undertaker's son finds some gold coins in the cemetery while burying his dog. The vain teenage daughter, who is, frankly, a scream, gets to be a rich girl for a day, perhaps a bit too publicly. Next thing you know, the whole town is digging up the cemetery. Finally, logically, the disturbed dead take the stage. This one's not exactly subtle, either, but it's funny, it builds to a meaningful climax, and I'll bet it works well live. Sandrow includes a scene from another from another Pinski play, Yankl the Blacksmith, just to show that Jewish playwrights did actually write about lust and adultery and other typical dramatic subjects (and the scene is well-chosen - it's like Jewish Tennessee Williams). But four out of the five plays in her excellent book are primarily attacks on greed. I can't be expected to work for the sake of ideals alone - in America, thank God, people know the value of a pious Jew. More samples from Nahma Sandrow's God, Man, and Devil: Yiddish Plays in Translation. I had not planned to write about this for more than a couple of days, but My Life in Book's perspicacious question has inspired me, although to what, who can say. Two major themes dominate early Yiddish literature: one is ignorance and superstition, and the other is greed. Both are threats to culture. Outside oppression - anti-Semitism and pogroms - is a distant third, although it comes to the forefront as conditions in Russia worsen. For the Yiddish writers who emigrated to America, to New York - and all of the plays in this book are American - superstition has receded, and the pogroms have been left behind. That leaves greed, mostly. I can be this reductive in part because there isn't that much Yiddish literature and these themes really are very common, and in part through pure ignorance (but not superstition). Shabby theatrical office, Broadway area, 1920s. MENAKHEM-YOSEF is a producer; JACK is his assistant. MENAKHEM-YOSEF. A spitter. What do you mean, a spitter? JACK. A novelty. I know this kid who can spit further than anyone in the world. His record is nineteen feet. MENAKHEM-YOSEF. Nineteen feet is no novelty. It seems to me that somebody has already spit further. He's already been outspat. JACK. What are you talking about, Mr. Menakhem-Yosef? Nobody has spit nineteen feet yet, except for the Philadelphia spitter, and he's dead. MENAKHEM-YOSEF. See that? It's the nation's best men that die the youngest. How much will he take? JACK. The spitter? Four hundred fifty a show. But I think he's good value. MENAKHEM-YOSEF. Certainly he's good value, who's talking value? But that's too high for me. I can't be expected to work for the sake of ideals alone. I can't bring on the Messiah single-handed. JACK. What did you just say? Messiah. Messiah? Quiet. Why not bring on the Messiah? How is the Messiah any worse than a spitter? I don't want to, but I'll stop there. They're going to put on a Broadway show in which the Jewish Messiah comes to earth. They plan to sell shares in the First Messiah Redemption Corporation. "Redeemed from what?" "How the hell should I know? What difference does it make? Jews want to be redeemed." They get Jack's uncomprehending uncle to play the Messiah, and pay h im thirty-five dollars a week, because "In America, thank God, people know the value of a pious Jew." This is all completely outrageous, an affront to decency and good taste. Sandrow compares the playwright's humor to a sock to the jaw. That's about right. What happens next? Don't know, exactly. Sandrow only includes this one scene! More than what I wrote, but only about four pages, all just as good. "It culminates in a boxing match between two competing Messiahs: the one who appears in this scene and a young motorcycle tough." Oy, you're killing me, I want the rest! And so on. The play is (here's a Yiddish lesson) Bronks Ekspres, or Bronx Express: A Dream in Three Acts (1919 or so), by Osip Dymov. FLAMES. (Points to the subway ads.) Do you see that Pluto Mineral Water? HUNGERPROUD. The red devil with the tail? FLAMES. Yes. Twenty-five million. I know him - he's a buddy of mine. Or Tuxedo Tobacco, "Your nose knows," forty million. Or Arrow Collars - he was a telegraph messenger boy. Who needs a collar? Do I need one? Do you? Bluff. Now he's worth one hundred million. Or Aunt Jemima Pancakes, "Delicious, economical, convenient," ten million. FLAMES. No? And people don't go every year to Atlantic City to the beach? And football and bathing suits, moving pictures and chewing gum, and ice cream, and shoeshine every minute. Do you have any idea what's going on with the Americans? Nestlé? That baby? Two hundred million. And Smith Brothers Cough Drops, three hundred fifty million. FLAMES. Each brother separately. Both together, five hundred. I like the con man's math there. Khatskl falls asleep on the subway, and, one thing leads to another, he ends up lounging in Atlantic City, married to a cigarette mascot, father of the Nestlé baby, with his own real family somehow tangled up in his dream. When Khatskl wakes up, has he learned his lesson about what's really valuable in life? Whaddaya think? A good part of the fun here is that several of the mascots are still in use, or at least distantly recognizable, and I suppose this would be even more fun live, seeing them wander around the stage. But I also like the critical thinking about advertising. the satire is still pretty much on target. Gee, people were on to the game back in 1919? The play deepens the bite, too - Hungerproud acquire his dream-riches by selling his Judaism. I haven't found a Yiddish writer yet who sees America differently. The opportunities for improvement are endless, and there's no going back to the shtetl, but the corruptions are endless as well. Bronx Express can be found in God, Man, and Devil: Yiddish Plays in Translation (1999), translated by Nahma Sandrow. The other plays in the book are not the off-kilter hoot that this one is, but they have their own merits. A little more Yiddish theater tomorrow. So if I were to take this idea seriously - when and how did poets and novelists start writing seriously about animals - I would have to look to their models, the naturalists and scientists and travelers, the Gilbert Whites and James Audubons and Charles Darwins and so on. Not that the direction of influence only had to go one way, or that a genius like John Clare needed their help, but that's where I think I'd start. "A right valiant and jaunty Chevalier is our hero; going about with his long Toledo perpetually drawn. Rely upon it, he will fight you to the hilt, for his bony blade has never a scabbard. He himself sprang from it at birth; yea, at the very moment he leaped into the Battle of Life; as we mortals ourselves spring all naked and scabbardless into the world." Not what I'm looking for - I do not believe this tells us much about the swordfish. That's from Commerce of the Prairies (1844). Gregg is trying to write a useful book, so most of his descriptions of wolves and mustangs and horned lizards are functional, designed to assist travelers. But there's good writing here, too. "Its long, leathery neck can stretch to the length of a baseball bat or recoil to a wrinkled nub. The neck resembles an aardvark's snout, an elephant's trunk or a monstrous prehistoric earthworm emerging from a fist-size shell, among other things." This is not the child's view, but the adult scientist's, aware that the astonishing beast was a Chrysaora quinquecirrha, or sea nettle. I marvel at all of the metaphorical language Wilson needs to describe accurately the jellyfish, not just the "drawn curtain," but also "wall" and "veil" and "bell." Good metaphors are not simply flourishes - what easier way is there to communicate just how the mass of tentacles are folded? Not a fancy passage. I am always skeptical when someone says that "not a word is wasted," but this comes close. As usual, the amount of fine writing, on whatever subject, turns out to be enormous, once I begin to look for it. I'm not convinced, though, that much of it, regarding animals, I mean, can be found in 19th century fiction! She saw; and purred applause." That's from "Ode on the Death of a Favorite Cat" (1748), and the cat is peering into a "tub of goldfishes" (hence the reflection), so you can see where this is going. The only phrase that looks to me like an original description of a cat is the "conscious tail"; otherwise, its just a catalogue description. "For I will consider my Cat Jeoffry. For having done duty and received blessing he begins to consider himself." Then follow the ten steps of Jeoffrey's self-grooming, not so different from what a ethologist might write: "For fourthly he sharpens his paws by wood. \ For fifthly he washes himself \ For Sixthly he rolls upon wash." Then there's the consummate description of a cat: "For he is a mixture of gravity and waggery." I find Smart's poetry very difficult, in general, but this is real observation. I always assume that William Blake's "fearful symmetry" and so on in "The Tyger" is based as much on an actual housecat as on an imagined tiger, but I don't really know. Who else is there - oh yes, Samuel Johnson's Hodge, who "shall not be shot," but I don't know of a poem about Hodge. Of cruel man, exulting in her woes. Or when a storm drew near." Now that's the kind of writing I like, the tortoise who behaves like a fine lady. I actually have not read White's The Natural History of Selborne (1789). I encountered the tortoise in an anthology, although I have no idea which, or of what (here?). White was a pioneering naturalist, a genuine scientist, so he falls into a different category than Gray and Cowper and so on. I think that's where I'll wander tomorrow. That hedgehog and cat live in Colette's Retreat from Love (1907), where we also find a toad, a bat, a dog, a crab, and probably other critters that I have forgotten. I read this novel fifteen years ago, I would guess, and I had to remind myself what it was about - a bunch of crisscrossing love affairs, lovely but diaphanous, hard to remember. I found it interesting that Chingiz Aitmatov had been a veterinarian, which certainly informed his writing about animals. Aitmatov reminded me of Colette, oddly. I mean, her world of Parisian courtesans seems pretty far removed from the Kazakhstani steppes. Who knows why she wrote about animals so much, and so well? She, like Aitmatov, observed their world carefully, and made it part of her book. Few novelists do that. Or am I wrong? Juvenile novels are menageries, right, definitely. I remember reading all sorts of animal stories - raccoons as pets, bears as pets, dogs and more dogs. I don't remember too well if any of them were that well written. I'll think some more. I had not really planned to write about this; maybe it won't go anywhere. Suggestions, though, are most welcome - who, novelist or otherwise, was good at writing about animals? Quotations from the Margaret Crosland translation, the only English version, I think. The Day Lasts More Than a Hundred Years contains one more surprising jab at the Soviet government that I did not mention yesterday. The protagonist grew up as a fisherman on the Aral Sea, and Chingiz Aitmatov vividly, angrily, describes its destruction. It's more of a sub-theme than a primary one, but this is, among other things, an eco-novel. Oh, this is better than I had remembered. "Powerful" and "beautiful," those are the thoughts of Yedigei, the protagonist. The next sentence is more objective, but by the word "reproachful," perhaps, we have entered into the perceptions of the fish. So Aitmatov leads us into the fish. First we, with the people, see the eyes of the fish, then, with the fish, we see the shining eyes of the people. The gaze into space actually hints at the science fiction subplot and the climax of the novel. Aitmatov was actually a veterinarian before he became a writer. That explains his interest in animals, perhaps, but not the way he writes about them. I have some bad news. I recently came across the name of Chingiz Aitmatov, Kyrgyzstan's "greatest writer". I read one of his novels, The Day Lasts More than a Hundred Years (1980). Here's the bad news: it's good, really quite good. Here's worse news: it is, strictly speaking, socialist realism. I'm joking, but I'm not. If there were a single literary genre which I thought I could completely skip, that must be entirely without literary value, it was socialist realism. Meine Frau tells me that she once read an East German socialist realist novel about apple-cheeked young factory workers who inspired their colleagues to ever-greater productivity. That is definitely not the novel Aitmatov wrote. Burannyi Yedigei works at a railroad junction in the southern Kazakhstani steppes. His best friend has died, and Yedigei organizes a journey to bury him in a traditional cemetery. That gives us the "day" of the title; we rummage around in Yedigei's past as he rides his camel across the steppes. We learn about his World War II service, his relationship with a young family who are exiled to the railroad junction, and his perhaps even more complicated relationship with his bull Bactrian camel. There's a lot about camels. Some of the best writing is about the camel. The Day Lasts More than a Hundred Years has, intermixed with Yedigei's story, a genuine science fiction plot, about alien contact. The novel also dives back a lot farther than a hundred years to pull in a couple of "traditional" stories, one from the oral folk epic Manas, one of Aitmatov's own invention. So we sometimes leap from cosmonauts on a space station to a legendary tale of warrior nomads who tortured their captives until they became mindless automatons, and a heroic mother who tried to rescue her enslaved son. Science fiction fans may very well find this more irritating than reg'lar ol' readers of literature. My only criticism is that some of the allegory is a little bald. But the linked layers work - they mean more together than they do spearately. The tortured and brainwashed slaves, a weak-willed rationalist who argues that soon the state will control people's behavior through radio waves, a science fiction plot that is clearly a criticism of the Iron Curtain and Soviet cultural isolation, and an entire novel that seems to me plainly to advocate individualism within the context of a traditional culture, and whose protagonist is unapologetically Muslim - how was this published in the Soviet Union in 1980? I don't know, and neither does the author of the foreward, Katerina Clark. She suggests that the Soviets were allowing more expression of nationalism by minorities, and that Aitmatov was a Communist insider, and that the novel is sufficiently ambivalent that the Soviets could let it through. I did notice that most of the really bad activity in the novel occurs under Stalin, and there are just a few pages of dull stuff near the end ("We must, all of us, all as one, hold on to this view of justice," and so on, p. 320) that sound like the real socialist realist deal. Was that really enough to assuage the censors? Lest I give the wrong idea, I don't want to claim that Aitmatov's novel is One Hundred Years of Solitude or Midnight's Children or The Emigrants or Things Fall Apart, one of those novels of big international reputation that most readers should probably try just to see what the fuss is all about, nor that it's a great injustice that the novel is virtually unknown. But it's a modest injustice, and I would like to read more of Aitmatov's books.